UPDATE: FireDogLake has posted an account of Hamsher and House's detention at Quantico Sunday afternoon. Michael Whitney confirmed that Hamsher and House's cars were towed, and that the two were "detained for two hours up until Manning’s visitation time period was set to expire at 3:00." Activist reporters who tried to deliver a petition protesting Bradley Manning's treatment by the US military were blocked from seeing Manning and held against their will at Quantico on Sunday, while their cars were towed on seemingly flimsy pretenses, the reporters say. FireDogLake blogger Jane Hamsher told her Twitter followers that she was detained at the gate to the US Marine base at Quantico when she showed up to deliver a petition signed by 42,000 people, demanding that the US military take Bradley Manning -- the alleged source of the State Department cables released by WikiLeaks -- out of solitary confinement. "Now been here at Quantico gate for 30 min.," Hamsher tweeted early Sunday afternoon. "Will not let us leave base, holding us." David House, a computer programmer who works with FireDogLake and is one of very few people authorized to see Manning, reported similar issues as he arrived at Quantico on Sunday to ask Manning about conditions in the prison. "Detained for 40 minutes now upon entering base," he tweeted. "Advised that cannot leave." House then reported that he would not be allowed to see Manning, that his car was searched and impounded, and that a military police officer reportedly told him the orders to do so "came from on high." "I am on approved visitation list; have been visiting since September," House tweeted. Hamsher said she was ticketed and her car was towed because she offered only electronic proof of car insurance, not a paper form. "Can't leave base, can't go to brig, can't get my driver's license, [military officer] threatening to arrest us. Haven't done a thing," Hamsher tweeted. Hamsher and House's detention was not resolved as of the time of publication. The military's newly antagonistic attitude towards Manning supporters may have to do with his lawyer's declaration last week that the military was treating the accused Army private unfairly. 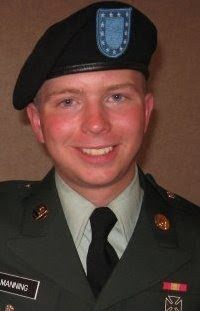 During this time, Manning was forced to stay in his cell around the clock, stripped to his underwear, the lawyer said. His prescription eyeglasses were taken from him, except for the hour of television he is allowed to watch or when he was reading, Coombs added. On Wednesday, Coombs filed a complaint with Marine Corps Base Quantico, alleging that the commander of the brig, or detention facility, abused his discretion by placing Manning on suicide watch. After his suicide watch, Manning was reportedly returned to "prevention of injury watch," under which he spends 23 hours a day in solitary confinement, has little access to outside media and has no pillow or blanket. According to Coombs, even the "prevention of injury watch" is unnecessary in Manning's case. Many of Manning's defenders say the US is trying to use its leverage against the Army private to pressure him into testifying against WikiLeaks founder Julian Assange, something the New York Times suggested last month. The United Nations' special rapporteur for torture has reportedly launched an investigation into complaints that Manning's treatment at Quantico amounts to torture.